Too soon, it was time to leave Bogota. I would definitely return to see more. Our friendly driver and I chatted all the way to the airport as we drove past the throngs of bicyclists on a parallel, closed boulevard. It was bicycle Sunday. 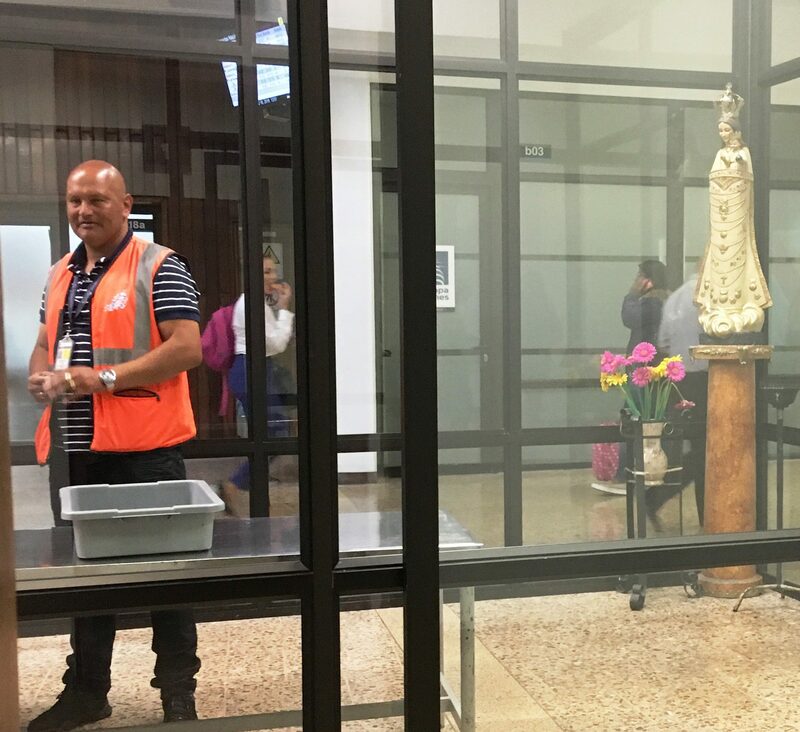 In the airport, we were looked after by the Virgin Mary and this hard guy. I wasn’t sure what his look implied as I took a photo of the BVM—was he amused? Insulted? Would he tackle me to the ground for taking photos in a security area? Our 45-minute flight to Medellin was uneventful, but there was no driver waiting for us on the other end. We waited 15 minutes, then I sent a What’s App message to Responsible Travel’s “emergency” number. Responsible Travel quickly responded that they were checking. Was this an emergency? Not really. But as the minutes ticked away, we thought it had been best to contact them. If we took a taxi to our hotel, it might cost the driver—who perhaps was just stuck in traffic—his day’s big fare. After half an hour, a man appeared and explained there had been two flights from Bogota at the same time and he had been waiting at the other one. He seemed angry that we hadn’t been on the other flight. Had he not been given the flight information? He stomped away with our bags, not looking back. We ran to keep up with him, and this time I sat in the back because he was clearly unhappy and noncommunicative. Was he mad that we had contacted Responsible Travel and “snitched” on him for being late? It had only been a half hour delay, but we hadn’t known it was going to be a half hour, so what else should/could we have done? When he dropped us at the hotel he managed to say thank you for the tip, then was gone. La Campana (The Bell) Boutique Hotel was very nice, with two real beds this time. The mattresses were as hard as concrete, and they must have been slung on ropes because they made loud creaking noises with every slightest move. 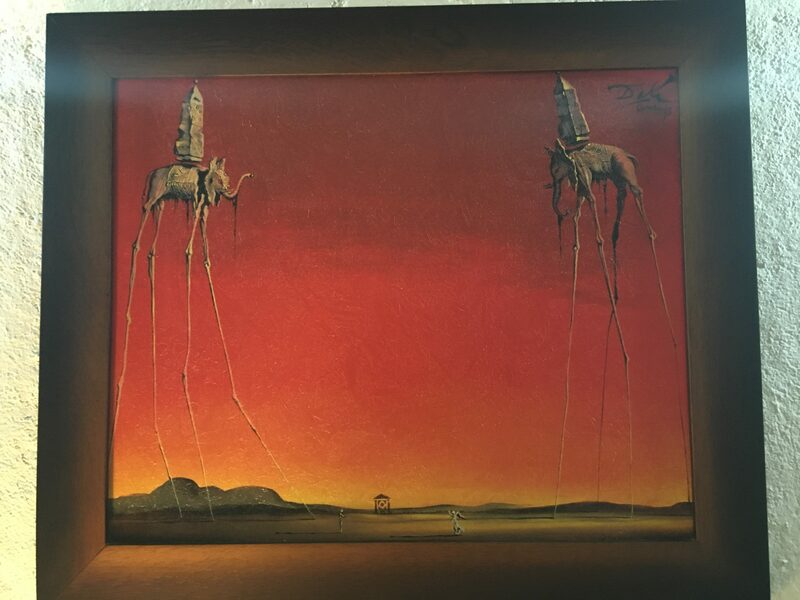 The art, once again, was “interesting,” this time by another European artist, Dali. “There’s a mini bar!” I exclaimed happily. It was stocked with water, which according to the menu cost 3000 pesos. I was still getting used to the currency conversion and had my usual reaction to overpriced hotel room water until I realized it was only $1. “Look, firewater!” I told Lynn as I held up one of three bottles in the mini bar. And they were not mini bottles, but serious 750ml bottles. 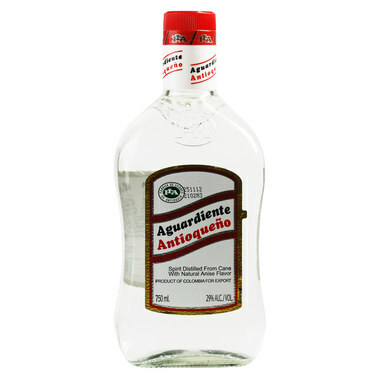 Aguardiente literally means fiery water. In Colombia, the eponymous local brand is distilled from sugar cane molasses and anise essential oils. The resulting booze apparently tastes like pastis, sambuca, or anisette. Ugh. It wouldn’t be hard to resist. Lynn was ignoring me, until I got to the sausages. 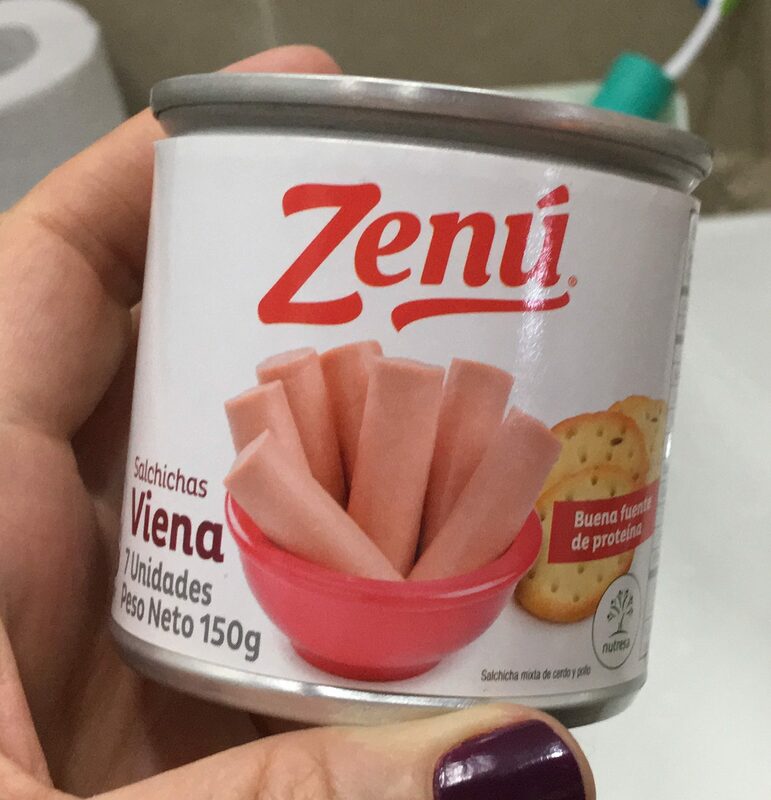 “Salchichas Viena!” I called out. Lynn and I have had long conversations in places from Chicago to Cornwall about what proper sausages are. Anything that looks like severed human fingers are not. The wireless signal was strong in the lobby but grew progressively weaker as we climbed the stairs and walked down the hall to our room. In order to communicate with Roxana, who we hoped to meet later, I had to leave the room and walk down the hall to the top of the stairs. This was okay. I had little Internet access for 10 days, and I have to say my mind felt calmer. Did I use this to reset my cell phone habits? No. 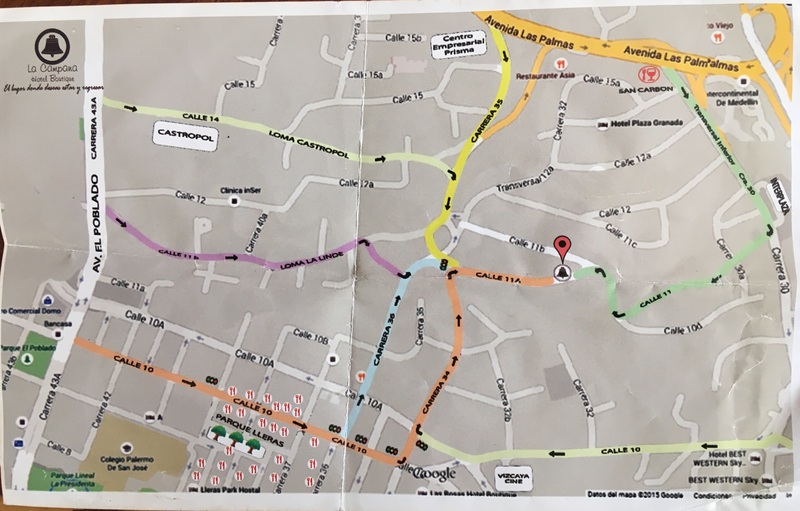 We were to meet Roxana at the nearby Park Lleras, so we asked for a map at the desk. “No one can find our hotel,” the desk clerk said, obviously shy about speaking English. This entry was posted in Adventure, Budget travel, Culture shock, Travel and tagged Colombia, Medellin on April 12, 2018 by Breaking Free.